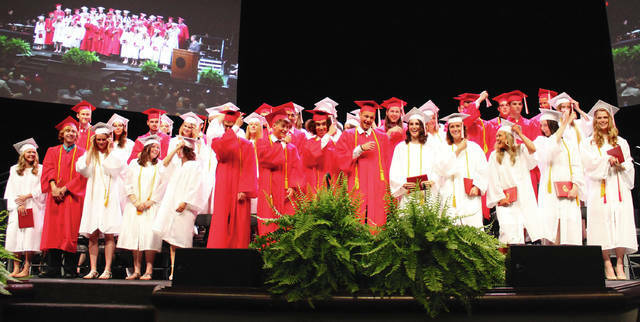 Anna Bolton | Greene County News Seniors from the Cedarville High School Class of 2018 move their tassels May 24 during graduation at Cedarville University. Colton Lewis recognizes Maxine Hague, secretary and EMIS coordinator, for her many years of service to the high school. Lydia Young waits to lead her class into the auditorium. 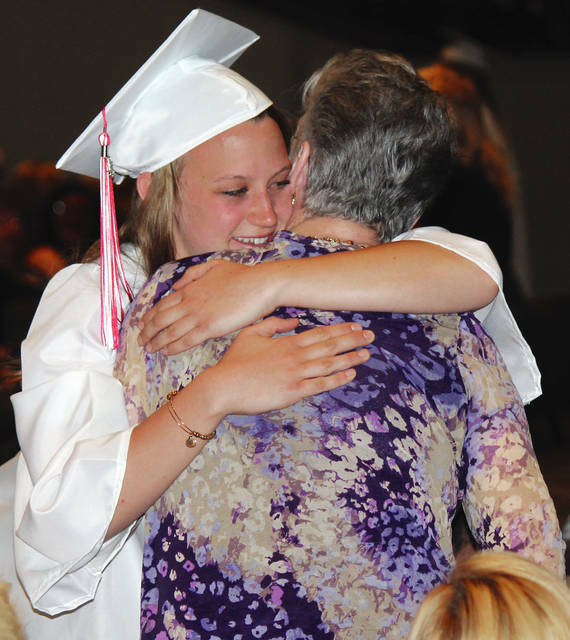 Students give roses to their parents and grandparents — a Cedarville High School commencement tradition. Valedictorian Mitchel Anderson gives a speech during the ceremony. 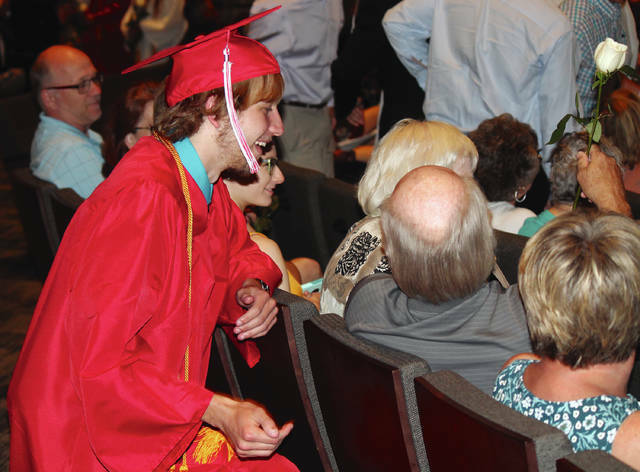 Co-salutatorian Jonah Sheridan speaks to his classmates and the crowd. 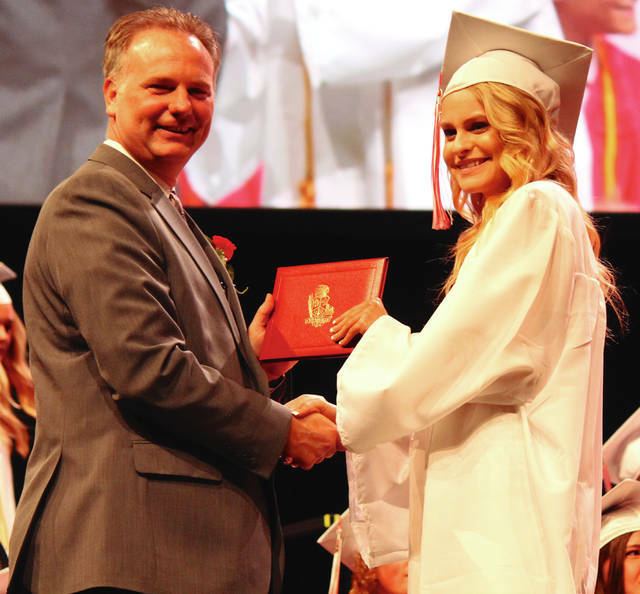 Kayla Helmick receives her diploma from Superintendent Chad Mason. 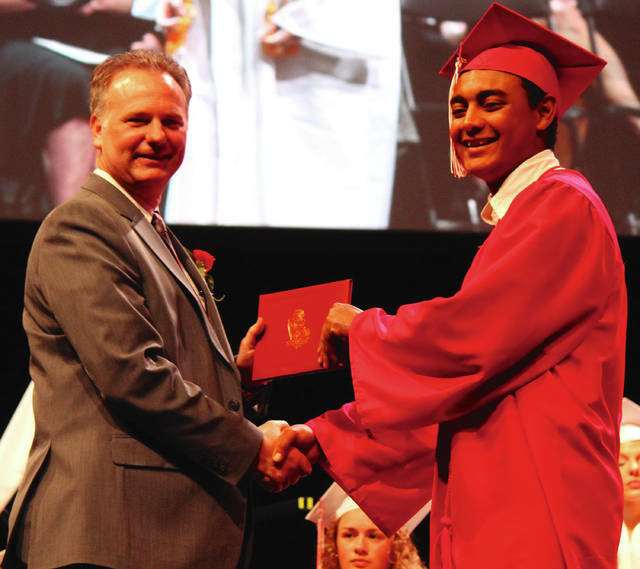 Superintendent Chad Mason gives Merrick Garcia his diploma. 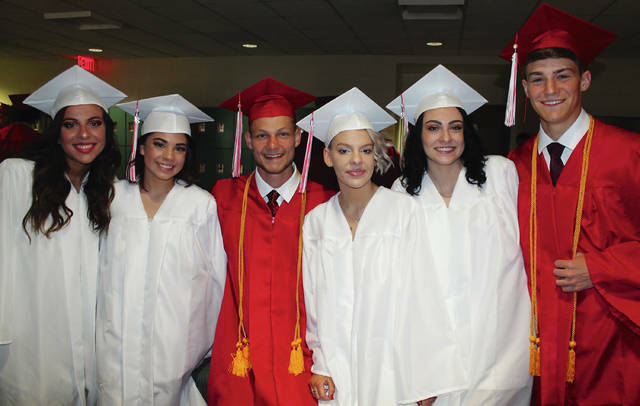 The graduates celebrate as they leave the auditorium. Principal Chad Haemmerle addresses the graduating seniors. Class president Madalyn Bigham addresses her peers. Seniors from the Cedarville High School Class of 2018 move their tassels May 24 during graduation at Cedarville University. 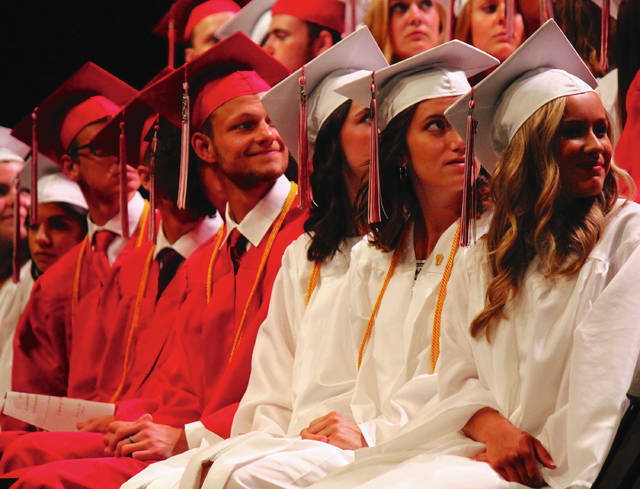 https://www.xeniagazette.com/wp-content/uploads/sites/32/2018/05/web1_Tassels-1.jpgAnna Bolton | Greene County News Seniors from the Cedarville High School Class of 2018 move their tassels May 24 during graduation at Cedarville University. 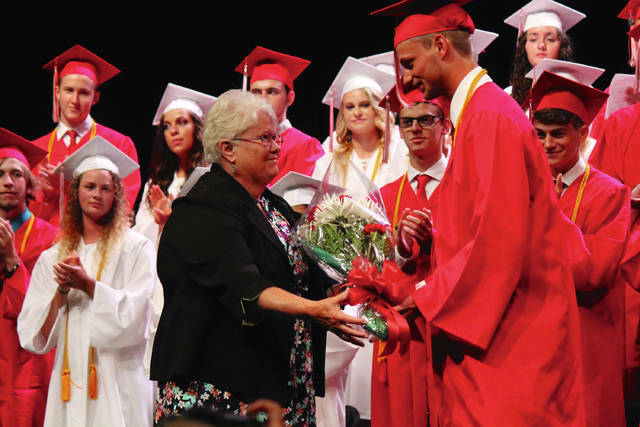 https://www.xeniagazette.com/wp-content/uploads/sites/32/2018/05/web1_Hague-1.jpgColton Lewis recognizes Maxine Hague, secretary and EMIS coordinator, for her many years of service to the high school. https://www.xeniagazette.com/wp-content/uploads/sites/32/2018/05/web1_Girl-1.jpgLydia Young waits to lead her class into the auditorium. 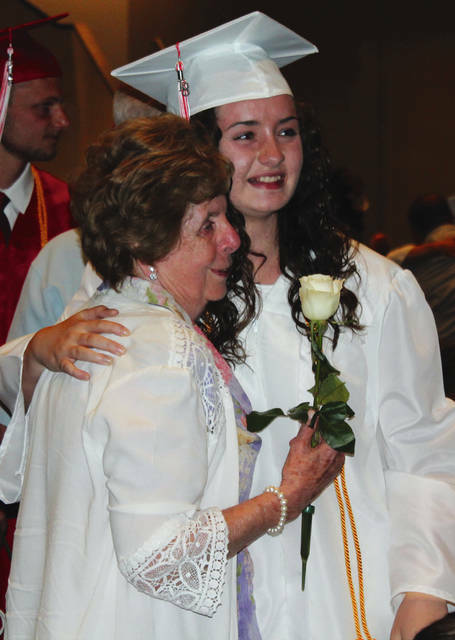 https://www.xeniagazette.com/wp-content/uploads/sites/32/2018/05/web1_GrandpaRose-1.jpgStudents give roses to their parents and grandparents — a Cedarville High School commencement tradition. 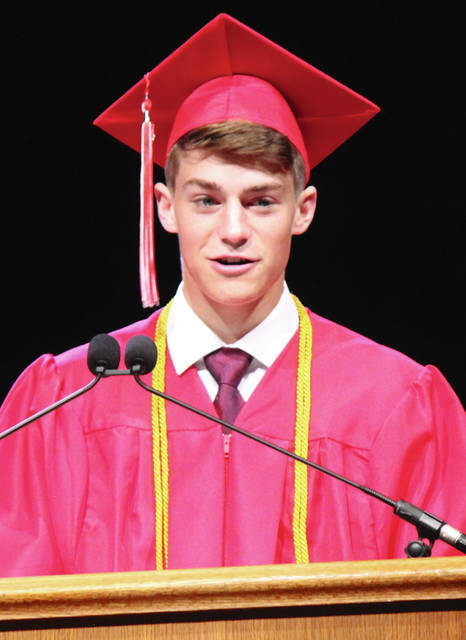 https://www.xeniagazette.com/wp-content/uploads/sites/32/2018/05/web1_Val-1.jpgValedictorian Mitchel Anderson gives a speech during the ceremony. 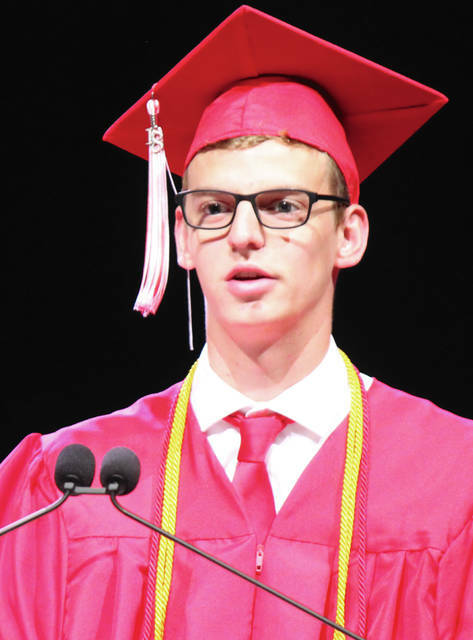 https://www.xeniagazette.com/wp-content/uploads/sites/32/2018/05/web1_Sal-1.jpgCo-salutatorian Jonah Sheridan speaks to his classmates and the crowd. https://www.xeniagazette.com/wp-content/uploads/sites/32/2018/05/web1_HelmickDiploma-1.jpgKayla Helmick receives her diploma from Superintendent Chad Mason. 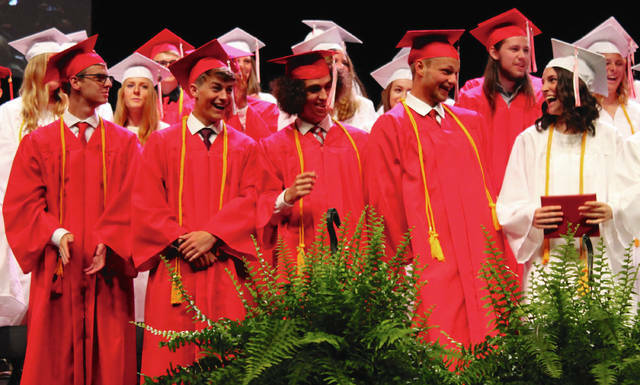 https://www.xeniagazette.com/wp-content/uploads/sites/32/2018/05/web1_Garcia-1.jpgSuperintendent Chad Mason gives Merrick Garcia his diploma. 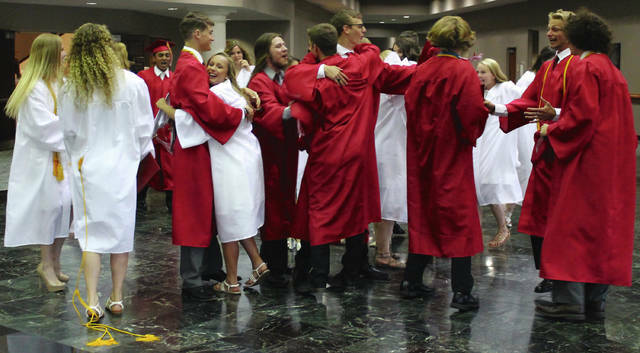 https://www.xeniagazette.com/wp-content/uploads/sites/32/2018/05/web1_Hugs-1.jpgThe graduates celebrate as they leave the auditorium. 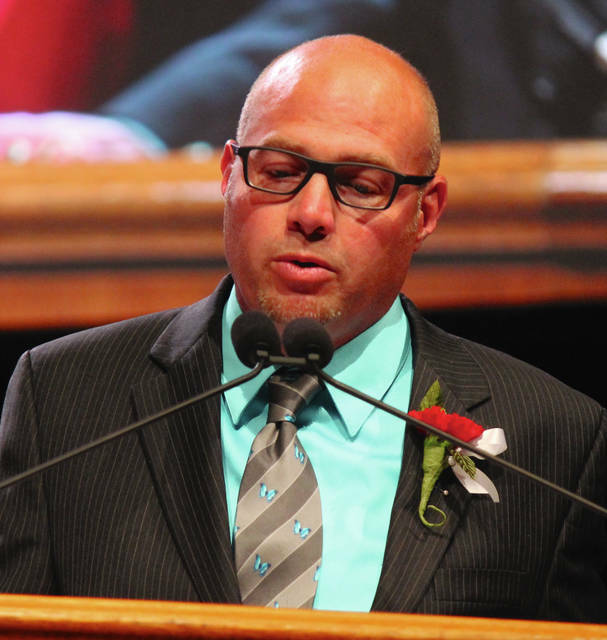 https://www.xeniagazette.com/wp-content/uploads/sites/32/2018/05/web1_Principal-1.jpgPrincipal Chad Haemmerle addresses the graduating seniors. 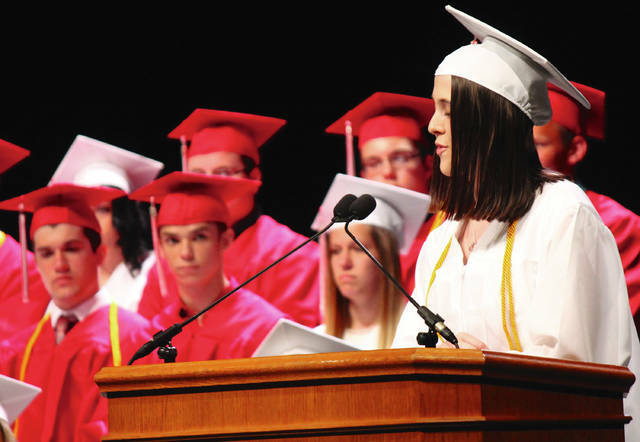 https://www.xeniagazette.com/wp-content/uploads/sites/32/2018/05/web1_Speaking-1.jpgClass president Madalyn Bigham addresses her peers.